This 3500 sq ft secluded cabin is ideal for your family getaway or a special retreat with that someone special. The kitchen is fully equipped with a farmhouse table that seats six, and a pub table that seats four - that can be used as a game table as well. Enjoy a breathtaking mountain/lake view from the deck while drinking your coffee or grilling, while the kids play. If you are seeking hiking, biking, boating, fishing, scenic driving, nature photography, motorcycling, whitewater rafting, or vacationing, you will find a full array of natural destinations, quaint shops and the rich history of North Carolinas most remote county! Graham County takes pride in it's rich heritage, local crafting, mountain music and dancing. Included in our heritage is the original people of the area, the Cherokee Nation which has an even older history. Crossing Deals Gap at the Tennessee/North Carolina state line, the Dragon is considered by many as one of the world's best motorcycling and sports car roads. Anyone looking for an exciting highway adventure will enjoy this stretch of US 129. The western North Carolina mountains offer some of the best whitewater rafting/paddling rivers on the east coast. The Nantahala River, only a 20-minute drive from our cabin, is one of the most popular. This Class I, II, and III river is the perfect place for the entire family to have a taste of this exciting sport. This 29 mile long lake has more than 240 miles of almost totally undeveloped shoreline. 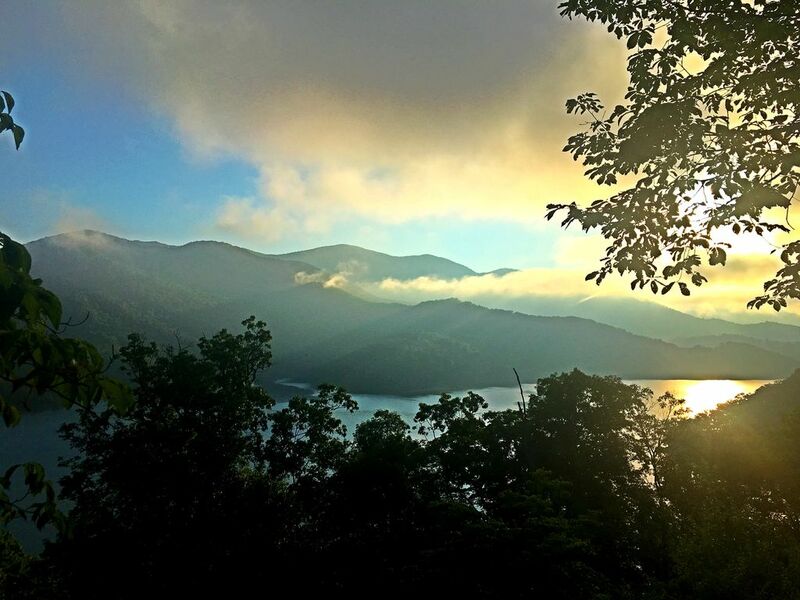 More than 90 percent of the land around the lake is owned by either the Great Smoky Mountains National Park or the US Forest Service and development has been kept to a minimum. David and I own Southern Heritage Woodworks in Sylvester, Georgia. We manufacturer flooring and furniture out of reclaimed wood salvaged from old textile mills built prior to the 1920's. We have three boys, 26 21, and 19. We love to spend time at our cabin to relax and just get away from everyday life. We especially enjoy our time during the Fourth of July. All of our family travels up and we grill and go boat riding, tubing and wake boarding on Fontana Lake. The water is as clear as spring water and still refreshing in July and best of all is not crowded. We love the seclusion of our cabin. We have the privacy and tranquility of sitting on the deck, drinking our coffee and enjoying nature. Full bath located in Master bedroom on 2nd Floor and another Full Bath located on 2nd Floor/ Full Bath located on 1st floor and full bath located on 3rd floor. At this time, internet is provided by HughesNet. TWO living rooms are in this house. One is located on the first floor and the other one is on the main level. TV's are located in Master Bedroom, 2nd floor Living Room and 1st floor living room. Very roomy with a beautiful view. Beautiful home and spectacular view!! Plenty of room for the 10 people that were on this trip. The beds were comfortable and we loved the porch looking over the lake and mountains. Visited Bald River Falls and it was so worth the drive. Very quiet, plenty of room for our large family. We enjoyed using both living area spaces. Both had a spectacular view of lake Fontana. The weather was nice enough we were able to enjoy the deck. The kitchen was well equipped including modern appliances. We spent 3 nights there over Christmas. We had a great and memorable time. We spent a long weekend here and WOW is all I can say. The home has plenty of room for everyone to spread out and the deck is by far the best part. The view is undescribable - you have to see for yourself. We arrived late at night in the rain so the driveway was a little scary as we couldn't see very well. It's a long ways off the main road but once we woke up the next morning and could see where we were........it was amazing. We saw turkeys in the driveway every morning like clockwork at 7:30 am. My son and nephew (teenagers) scaled down the mountain to the water but said they wouldn't recommend it - too steep. We surely hope to return again one day to this piece of heaven on earth! I would recommend this vacation home to anyone looking to get away from everyone and everything! Five high school girlfriends enjoyed downtime in this beautiful home with plenty of beds and baths for everyone! The kitchen was well stocked and the home comfortable for all. Beautiful view of the lake. Enjoyed the quiet environment. Great place! Really comfortable & roomy! Loved the view & enjoyed our time on the front deck! It was a longer drive off the main road than I imagined. It was fine during the day, but a little frightening at night driving alone. Rates are subject to change until reservation is confirmed. 4 Night minimum on Holiday weekend.